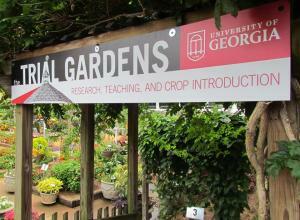 This garden is located in the heart of the University of Georgia and is renowned for new crop introductions such as the bestselling Homestead Verbena. New and unusual crops are displayed for industry and consumers. You can see the horticulturists in action as they determine the "best of the best" for our region's high heat and humidity that will go on to receive the "Athens Select" label for sale in garden centers. The Gardens are supported by landscapers, retailers, and nearly all of the world's major flower breeders. Open to the public daily during daylight hours. From the bypass, Loop 10, take the College Station Road exit. Turn toward the UGA campus on College Station Road. Cross a set of railraod tracks and turn onto East Campus Road. At the first light, turn left onto Carlton Street. At the second stoplight, turn right onto Lumpkin Street. Look for the South Campus Parking Deck on the right. Walk across Carlton Street ot the gardens. They are located behind Snelling Dining Hall and next to the Pharmacy building. Parking is available in the South Campus deck.